It is a quarterly journal for informed critical evaluations of various areas of Literature, English Language Teaching, Translation studies relating to emerging and established genres. A fresh and invigorating evaluation of the contributions of writers and their significant writings are on offer in the Journal. Also deals with Linguistics and literature; Literary and literary theory; Bhasa studies, etc. In more ways than one, Arundhati Royâ€™s latest novel The Ministry of Utmost Happiness continues the subaltern saga initiated in her debut novel The God of Small Things. Velutha, the titular â€œgod of small things,â€� was permanently silenced for trespassing on the upper-caste social spaces and violating its moral codes. In the forty yearsâ€™ interregnum between the fictional times of the two novels, the religious and sexual minorities too have joined the dalits in experiencing discrimination and ill-treatment and are required to constantly contend with outmoded moral codes, caste-based discrimination, and majoritarian violence. The Ministry of Utmost Happiness offers a mind-numbing account of how almost all its major characters experience silence for reasons beyond their controlâ€”birth, sexual orientation, social/cultural impositions, and so onâ€”but finally learn to break it in their own individual ways. In the process, they achieve a limited realization of their true selves and learn to manage the fear, hypocrisy, and negativity imposed on them. This paper charts their passage from passivity to autonomy and concludes that they offer, as a collective, a way out of the morass Indian society is now embroiled in. Bapsi Sidhwa has successfully carved a niche for herself in the realm of Asian womenâ€™s writings. Her empathy for her women characters reflects her sensitivity to the stifled voices and the unspoken plight of the subaltern, the marginal, and the subsidiaries. The characters have been described as shaped by prejudice born of religious inequality, cultural subjugation, and above all cataclysmic political upheavals like the Partition of India. Sidhwa, who wants a world free of patriarchy and hierarchy, obliges us to meet her women who can be heard and translated, but have been rendered mute in a space dominated by males. This paper studies, with reference to the novel Ice-Candy-Man, the infliction of sufferings on women and the formation of the subaltern identity thereby. It focuses on the character of the Ayah in the novel, who, as a victim of oppression, symbolizes the fate of the subaltern. Empathy being an interdisciplinary issue plays a significant role in art and aesthetics just like in psychology, philosophy, neuroscience, anthropology, and so on. Literature enhances the readerâ€™s qualities, social or moral, exposing him to hundreds of virtues and values. Graphic novel employing the dual medium, visual and verbal, has great potential to explore empathic abilities; as is often said, pictures are more powerful than words. Suzanne Keen, in the context of discussing narrative empathy of literature, observed this minutely and explained that traditional or canonical literature has the power to enhance oneâ€™s finer feelings with the help of narrative empathy. According to contemporary neuroscience, the reader or observer shows empathy due to the activation of the mirror neurons in his brain. And the reason for the activation of mirror neurons is the visualization of actions and incidents in the context of visual art such as painting, movie, and graphic novel, and internal visualization in the context of a text using only the verbal mode. The reader may experience a vicarious aesthetic encounter with a canonical text as well as with a graphic novel. This paper makes an empirical study of Amruta Patilâ€™s graphic novel Kari, situating it within the different theoretical frameworks of narrative empathy. The paper approaches the question of female identity in Willa Catherâ€™s My Antonia from a psychoanalytic perspective based on opposing Jacques Lacanâ€™s view of identity as a form of â€œmasqueradeâ€� and Julia Kristevaâ€™s view of identity as a form of â€œjouissance.â€� Though Antonia is a victim, she manages to establish herself as a desiring subject in the Symbolic. This is a study of demythologization of the concept of Nirvana (self-actualization) as elucidated in Gita Mehtaâ€™s Karma Cola. The study is an attempt to decanonize, delegitimize, deconstruct, and destabilize the metanarrative of the â€œSelf,â€� functioning within an Orientalist discourse that forms the crux of the ideation, dissemination, and preservation of mythic structures of the Oriental, especially spiritual, tradition. Existentialism is employed as an analytical tool to illustrate the insincerity of the thesis of enlightenment and the angst ensuing from disenchantment at the failure of the quest for mystical panacea within Eastern religious ethics. Politeness, a social interpersonal communicative behavior, is often associated with courtesy, solidarity, and friendliness. Face is considered to be an important aspect of politeness, and politeness arises due to effective face negotiation during interactions. It is assumed that people constantly negotiate their face needs to show politeness toward others. In intercultural contexts, the concern for face gains prominence. This paper focuses on the face negotiation process in intercultural discourse situations. Jhumpa Lahiriâ€™s â€œInterpreter of Maladiesâ€� has been chosen for this purpose. The techniques chosen for analysis include face negotiation, face-enhancing, and face-threatening strategies, and the method preferred is face negotiation theory. The analysis reveals that while negotiating their face needs and showing their face concern to others, the participants are guided not only by their cultural assumptions but are also influenced by the situational needs. Literature is the most conscious use of language. It is a language within language and an art of language. It is a special kind of human discourse in which the writer tries to communicate his/her vision or ideas in a highly individualized medium by resorting to a particular and, in part, unique use of language. This unique use of language is a process in which the basic concept is transformed into an effective and meaningful message. It is the most delightful and perfect form of utterance that human word can reach. Indian thinkers have their own distinctive concept of the language of literature in which they fully appreciate the oblique elements which they call vakrokti. In the present paper, an attempt has been made to unfold how Kuntaka treats the language of literature as vakrokti, delineating its nature and different levels. 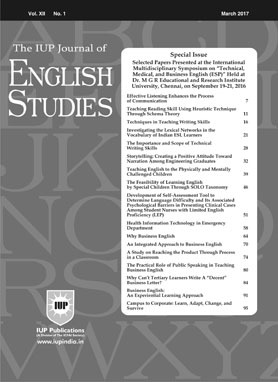 The paper problematizes the existing pedagogical methods of teaching language in the conventional classroom by deconstructing the Eurocentric language teaching methods. It also proposes postmodern pedagogy and metacurriculum for the autonomous learners by challenging the limitations of the conventional curriculum. The paper also deconstructs the existing ethnocentric model of language learning by proposing an ethno-relative model of language learning.